The Space Race officially began on October 4, 1957, when the Union of Soviet Socialists Republic (USSR) successfully launched Sputnik 1, the world's first Earth-orbiting communications satellite. It was a big deal. The 'bird' transmitted a continuous alternate series of pulses at 20.005 MHz and 40.002 MHz, with a 300 ms on and 300 ms off time. The batteries lasted through October 26. Sputnik 1 burned up in the atmosphere on January 4, 1958. Radio monitoring stations all across the Earth scrambled to detect and track Sputnik 1's signals while noting signal strength, frequency stability, time of detection, angle of arrival, and other parameters that were used to assess flight trajectory and electronics functions. Much of the data was voluntarily sent back to Russia from the U.S. and other nations in the interest of advancing science. Amateur radio operators played a huge role in the effort. 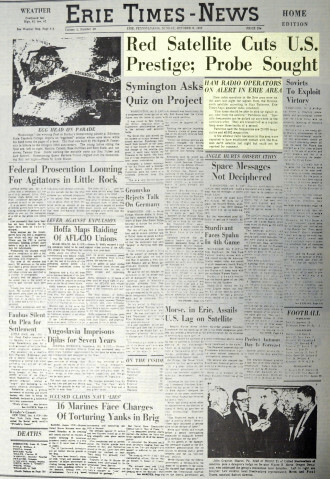 The front pages of newspapers everywhere splashed headlines announcing the launch of Sputnik 1, similar to the one shown of the Erie Times News, the newspaper of my adopted hometown of Erie, Pennsylvania. Back then, the Russian, Chinese, North Korean, and other Communist nations were often referred to as "The Reds" - not to be confused with the Cincinnati ball team. "Red Satellite Cuts U.S. Prestige; Probe Sought," was the headline here. National intelligence and media agencies were scrambling to learn as much as possible about the new phenomenon that represented at the same time both a significant advance in technology and a potential threat to security. "Ham radio operators in the Erie area were on alert last night for signals from the Russian earth satellite, according to Stan Patterson, Erie Times-News amateur radio columnist. Patterson said the frequencies are 20.005 megacycles and 40.002 megacycles. A few amateur radio operators in this area were reported to have established contact with the Russian earth satellite last night but could not be reached for comment." An Internet search for more about the Ham reports from Erie did not turn up any additional information. October 1957 was 59 years ago, so it is possible that Stan Peterson has not yet become a Silent Key. If anyone reading this story knows Stan, please let him know that we (I) would like to hear from him about the Sputnik monitoring effort here in Erie. Note that the Erie Times-News had a dedicated amateur radio column back in the day. It had a column for model airplane enthusiasts as well. "Hands-on" hobbies where participants built and maintained most of their equipment had more of a "wow" factor in the early days of technology explosion. The availability modern ready-to-use gear has shifted focus more to operational proficiency than on the technical prowess. Some old-timers lament the evolution, but I see it as a win-win scenario because anyone who wants to can still design and/or build and/or restore vintage equipment AND operate it, while others less technically inclined or simply not wanting to spend the time can concentrate on useage skills. The level of operator proficiency in all realms of hobbies has undeniably improved due to the option.